The Kissed Mouth: Viva Pre-Raphaelite! 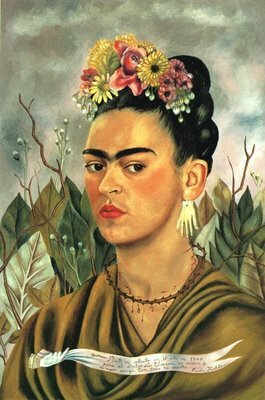 I am a huge fan of Frida Kahlo, have been since I did a year of modern art as part of one of my degrees. While planning the Walker Wedding shin-dig I have been drawing on her imagery and life for inspiration. An artist, confined by illness, married to a fellow artist who led her a bit of a merry dance, the issues over children... hang on, I thought, this is all a bit familiar... Did my love of Frida come from my love of Elizabeth Siddal? How far is Frida Kahlo a secret Pre-Raphaelite? When you think of the art of Frida Kahlo, the chances are that you are thinking of the same qualities as the art of Dante Gabriel Rossetti: a half or three-quarter length portraits of unconventionally beautiful women. I would like to ask Ms Kahlo if she had ever seen any of Rossetti's portraits of Jane Morris as it strikes me how much her work draws on the same vision. 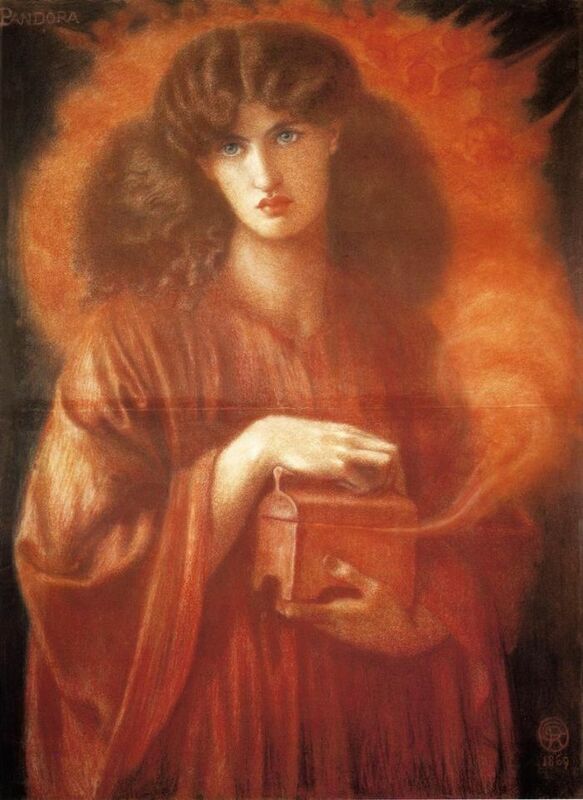 Anyway, it's not just the passing iconic resemblance to Jane Morris that got me thinking, it was more the spiritual sisterhood she seemed to hold with Elizabeth Siddal. More specifically, it was that both women seem to have built a self-image from their confinement due to illness. 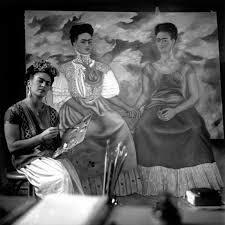 Kahlo's illness was from a horrific accident, which compounded damage done to her by polio (and possible spina bifida). This meant that great parts of her life were not only spent housebound, but flat-out in a bed with nothing to do but paint. Through these extraordinary portraits you get a vision of 'separateness' which goes beyond loneliness. Both women were harsh with their self-projection, Kahlo emphasising her brows and facial hair, Siddal pinching her face and hooding her eyes. Both women also drew painful inspiration from the betrayal of their lovers. 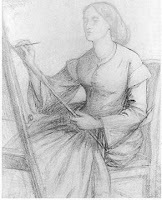 Think of Siddal's poems Worn Out or A Silent Wood, and the destruction that has been done to her by her inconstant man. In Worn Out her love seems to physically turn on her, hurting her 'I cannot give to thee the love / I gave so long ago, / The love that turned and struck me down / Amid the blinding snow.' 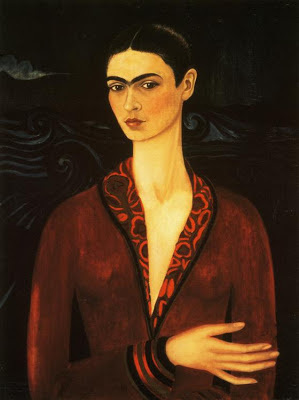 Likewise, in Self Portrait with Cropped Hair, Kahlo's loss of her love is expressed through her rage and cropped hair (the verse speaks of how she believed he loved her for her long hair and now her hair is short he does not love her). 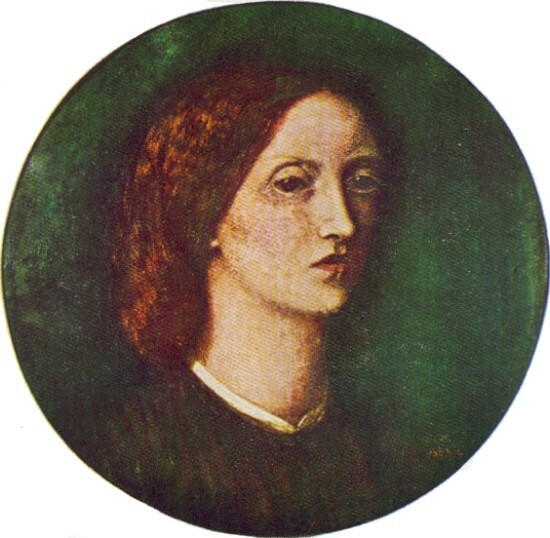 It is easy to see similarity in the relationship of Siddal and Rossetti and Kahlo and Rivera. Possibly it's tempting to generalise about artists and their temperaments, living together disastrously. Arguably, Kahlo gave Rivera as much hell as he gave her, but that is possibly reflective of the times in which they lived. There are artistic couples who fought and couples who were happy, but still couples where both are artists are still relatively rare, which may be an indication to things like ego and vision. I think one aspect of life they both tragically shared was their devastation over childbirth. Kahlo's accident and Siddal's illness and laudanum-use rendered both their bodies unable to carry children which caused both of them horrific distress. 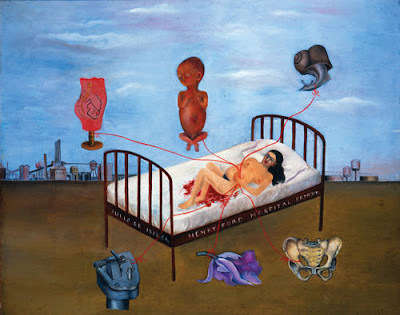 Kahlo's found vent in some of her most visceral works (the one above is relatively tame), but Siddal's internalising contributed to her early death. 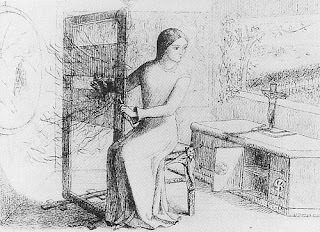 It is symptomatic of her time that Siddal could not express the loss of her child fully, although there may be shadows of it in her poetry. 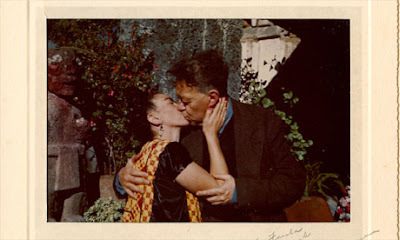 Kahlo found some recognition, if not comfort, of her loss through her work and moved beyond these moments, as if by trapping them on canvas they could not damage her further. What is certainly true is that for many people both Kahlo and Siddal mean one thing: death. Both are seen as women engaged in a drawn-out suicide, the architypal feminine implosion associated with artistic genius. Just as Siddal never fully escapes her Ophelia roots, then Kahlo is very often reduced to a Day of the Dead Catrina, sometimes literally. I have to admit this is a bit of an object of desire for me, and I really think Frida would have approved as she was a big fan of the Day of the Dead. 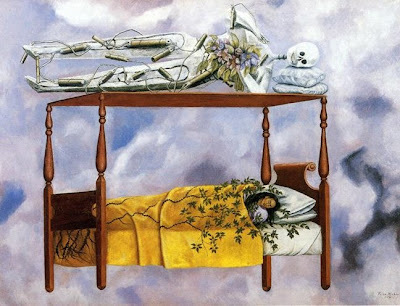 It strikes me that both Siddal and Kahlo are used by their audiences to express their own fears over mortality. 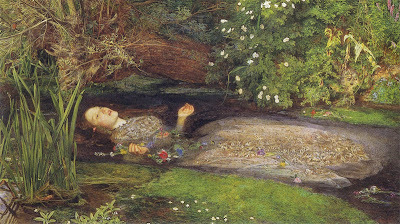 'Ophelia' Siddal is the doomed muse, drowning for the art of the men, a common summary of Siddal herself but one that in no way expresses the complexity and strength of her life. 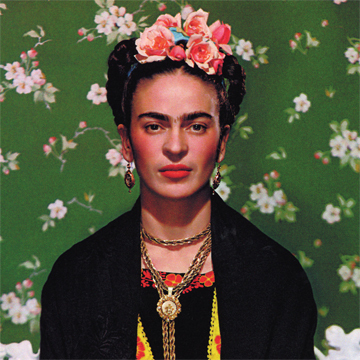 Similarly, the Kahlo who embraced death in art managed to live on into her 40s, young but considering her many health issues, testament to her strength of spirit. I think it is more accurate to consider the individuality of both women, the 'separateness' that they portrayed and inhabited. Just as Siddal drew upon The Lady of Shalott, imprisoned alone, Kahlo endlessly presented herself alone in a landscape of her own fears. Both women found expression for their own centre and within themselves they found beauty in a nightmare they had to be strong enough to paint and write. Possibly this is why they both inspire me so much. As Frida would say Viva la Vida because it is short and art is forever. Oh, Kirsty, I love this post SO MUCH. Living where I live here in Texas, I run into Frida a lot. She's pretty much a cult figure down here. Thanks for the refreshing alternative vision of her. 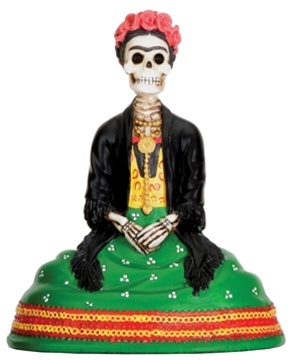 And what a wonderful idea to celebrate day of the dead in such a novel way. There is a cookbook out called something like Cooking with Frida or Frida Kahlo's cookbook. You might find some nice ideas there. Let me know if you need a care package of items you might have trouble finding :) Enjoyed the article. You always have a surprise showing up. Hugs to the wombat! Viva to the Walker household. A fascinating post linking these two seemingly disparate women artists - something I had never contemplated. Thank you for this extremely interesting point of view and I hope the Walker celebrations go really well in November. oh wow! love this! 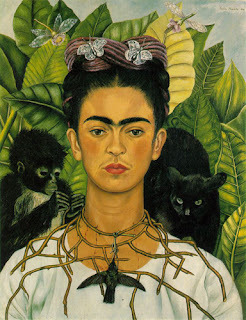 have loved both Frida and the Pre-Raphaelites forever. my art has been influenced by them for over 20 years. both histories mean a lot to me personally too. here is a blog post i did with Frida-inspired self-portrait photographs. i have many others that have been inspired by the story of "Ophelia" too. thanks! Glad everyone enjoyed this as much as I did! Many different things I like can be connected because I like similar things that they share. It's just a matter of looking.